David Stuttard is an independent scholar and theater director. 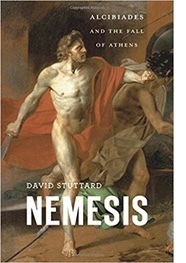 His latest book is Nemesis: Alcibiades and the Fall of Athens (Harvard University Press, 2018). His name? Alcibiades. Like Trump, this scion of wealth loved to win and manipulate the masses. 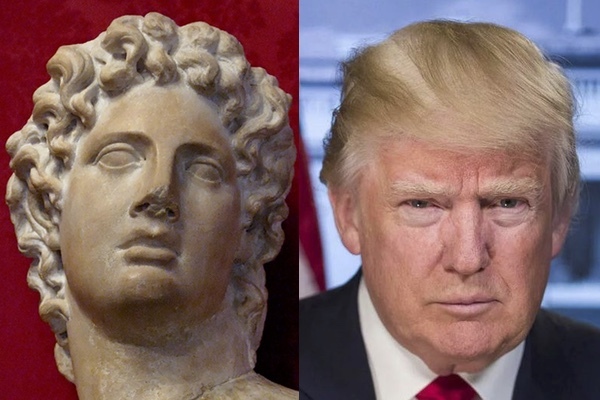 Privileged and narcissistic, a man who considered truth to be subjective, who casually manipulated facts to suit his own ambitious ends, who believed that the world was divided into winners and losers, and was determined to win at any cost, no matter whom he trampled on: Alcibiades was a politician for our times. And since, as George Santayana famously remarked, ‘those who cannot remember the past are condemned to repeat it,’ we would do well not to forget him today. Alcibiades was born to wealthy Athenian aristocrats in the middle of the fifth century bc, his city’s Golden Age. Orphaned as a child, he became ward of the powerful Pericles, and as a young man forged a close friendship with Socrates, who (it is said) saw his potential for both good and bad, and tried to steer him towards the former. But Socrates was not the only philosopher in town. By the late 430’s bc, Athens had become a honey pot for sophists, skillful men who, for hefty fees, taught rich young pupils to hone clever arguments to win debates in law courts or the democratic Assembly, where to persuade the people was to garner personal power. Tapping into inter-generational tension, the comic dramatist, Aristophanes, raised a laugh at their expense in Clouds, imagining a debate where Honest-Argument, personified as an old-school conservative, is trumped by his smart, young, charismatic, but decidedly amoral rival, Dishonest-Argument (in today’s vocabulary, “alternative truth”). While (perhaps unfairly) Aristophanes named Socrates as the quintessential sophist, he gave his pupil a dramatic pseudonym, but dropped none-too-subtle hints regarding his identity. A flamboyant young hedonist, who spent family money on racing chariots, he clearly represented Alcibiades. Alcibiades loved winning, and he desired passionately to win victory at the Olympic Games, the four-yearly festival that attracted competitors, businessmen and potentates from across the Greek-speaking world. Only the super-rich could afford a racing chariot. But in 416 bc, Alcibiades entered seven. Of course, he won, but not without skewing the odds. Not only was he alleged to have acquired the winning chariot through dodgy dealing, but by entering seven he could ensure that many would obstruct opponents and dash their chances. But for Alcibiades, even rigged victories were sweet. To celebrate, he commissioned songs and paintings, entertaining all the spectators to a lavish banquet – in part funded by friends from allied states, who, scenting future glories, were eager to bask in his success. But sporting triumph, delicious as it was, was never his ultimate goal. Alcibiades was more than just a pampered dilettante. He was determined to shine in politics, too, and (being well-aware of the jingoistic Athenian public’s imperial ambitions) he knew that war would afford him the opportunities he craved. So undermining peace treaties, he deliberately fomented conflict, and carved a glittering career as military commander. However, while he was preparing a strategically astute expedition against Sicily, whose success would massively increase his power and kudos, his enemies hit home. And they did so by targeting his private life. For all his statesmanship, Alcibiades was morally a loose canon. Flagrantly consorting with prostitutes nearly cost him his marriage, but it was scandal of another sort that brought him down. On the eve of the Sicilian expedition, public statues of Hermes (believed to keep the city safe) were found to have been systematically smashed. A second outrage followed: blasphemous young men were accused of profaning one of Greece’s most sacred rituals. And implicated in both was Alcibiades. Even at the time no one knew the truth. Today it is impossible to tell. But the powerful threat of potentially fake news was such that, rather than be impeached and stand trial, Alcibiades escaped while he still could. He found refuge in the unlikeliest of places: first with Athens’s mortal enemies, the Spartans, then withGreece’s mortal enemies, the Persians. Somehow through persuasiveness, charisma, and shamelessly offering to help defeat his city, Alcibiades managed to stay one step ahead in the grim game of survival. But still he wanted to bask in Athens’s limelight. Perhaps he was inspired by Achilles, the Homeric hero whose motto was “always to be best and to surpass all others.” When Achilles was slighted by the Greeks at Troy, he not only withdrew from battle, but asked Zeus to cause so much trouble for the army that they would beg him to return. Which was exactly what happened to Alcibiades. Riven by internal faction, defeated in war, and plunged into economic crisis, the Athenians voted to drop all charges and recall him. At last he was where he wanted to be: Commander-in-Chief, the most powerful man in Athens. But it could not last. The Greeks believed that hubris (crossing boundaries of acceptable behavior) unleashed Nemesis, goddess of retribution. And it took only a small error for the Athenian people to turn on him again. Once more he escaped, but time had run out for both him and his city. Athens fell, defeated by the Spartan-Persian coalition, which Alcibiades had once done so much to encourage, and in Anatolia Alcibiades was shot dead by assassins. Media savvy politicians, fake news, alternative truth: Karl Marx once wrote that “history repeats itself first as tragedy, then as farce.” But we, the people, should beware. Sometimes farce can be deliberately engineered, an alternative to blindside truth. Remove its bloated, grinning mask, and you’ll still find politicians every bit as dangerous as Alcibiades.